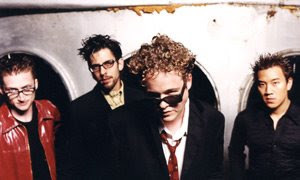 Really, Harvey Danger? Seriously? You couldn't have just pulled the tried and true "slow fade ever deeper into one-hit wonder obscurity"? No, you couldn't have, because 90 percent of the potential audience for your alt-rock pep isn't even aware that you exist in 2009, let alone that you tour. So you went and wasted your poor publicist's time - girlfriend had to cobble together and fire off an email press release that I can't even believe I bothered to read - not to mention unfathomable nanoseconds and amounts of energy that might have been more profitably spent switching CDs or emailing friends or doing actual work that scores of music writers (and didn't some of you used to be music writers? Thought I read that somewhere) wasted absorbing, deleting, and forgetting said missive. I mean, yeah, I still heart "Flagpole Sitta" as much as, like, anyone. But, c'mon. Everybody already wasn't missing you. Now we're still not missing you, but most of us kinda think you're tools.